After dinner speakers have for years immortalised the many stories of the things Bill Shankly did and said, and in many cases time has lent enchantment to the legend of the man and the other pioneers of the Liverpool Boot Room staff of the early 60’s such as Bob Paisley, Joe Fagan, Reuben Bennett, Roy Evans and Ronnie Moran. Here are some of the lesser known stories, many of which I can personally bear witness to from my time at Anfield between 1960 and 1965. During my time at Liverpool as a young player, I saw at first hand the fantastic charisma and motivational powers of Bill Shankly, and I was a witness to the authenticity of many of the stories of this amazing man that have found their way in to the folk lore of British football. I was there when he ordered the building of the famous shooting boards and sweat boxes at the Melwood training ground, where the training and coaching methods instilled by Bill Shankly and Bob Paisley were ultimately copied all over the world. 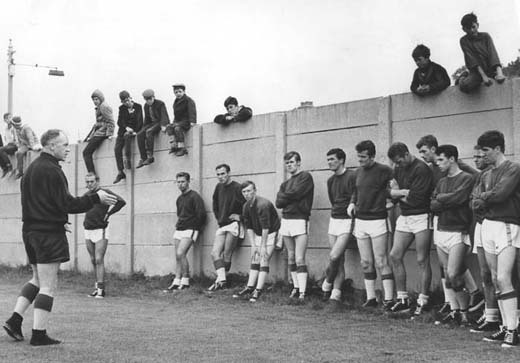 Shankly at Melwood preaching to George Scott and the lads on 24th July 1963. From left to right: Ian St John, Gordon Milne, Bobby Thomson, George Scott, Alfie Arrowsmith, Ronnie Yeats, Tommy Lawrence, Jim Furnell, F. Molyneaux, Alex Totton, Alan A'Court and Brian Halliday. I was in digs for three years with the famous Liverpool and England international winger Peter Thompson and Peter encouraged me to go in to see Shanks to ask for a wage increase as I had ended the season as leading scorer in the reserves. I came out of his office with a £5.00 suit voucher for John Collier the tailor on London Road. As Apprentice professionals, after cleaning the first team’s boots, painting the stands and clearing the rubbish from the Kop we used to play 5-a-sides in the car park behind the main stand every Monday morning. The opposition in these games was usually Bill Shankly, Bob Paisley, Joe Fagan, Ronnie Moran and Reuben Bennett. Our side was Bobby Graham, Gordon Wallace, Tommy Smith, Chris Lawler, and me. We never ever won those games because Shanks and company would have played until dark to make sure they got the result. It was from one of these games that the famous true story has been passed down to generations of Liverpool fans. We were playing the usual hard fought match and Chris Lawler was injured and watching from the sidelines. As we only had four men to their five, Shankly tried a long range effort to the unguarded goal which went over the shoe that we had layed down as a goalpost. He immediately shouted 'Goal we have won, time up, get showered boys'. Click the headline above and read our exclusive interview with George Scott. 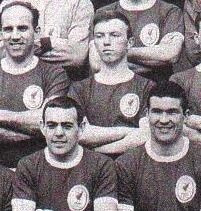 In the 1964/65 season I ended the season at Liverpool as easily the leading goalscorer in the second team at Anfield, and the first team beat Leeds United to win the FA Cup at Wembley. This was the first time that Liverpool had ever won the Cup, and it was a fabulous occasion, and the greatest day in the clubs history at that time. I remember walking up the Wembley pitch with Bill Shankly, Bob Paisley and Peter Thompson an hour and a half before the game. Bill looked at the masses of Liverpool fans behind the goal and said to Bob Paisley. 'Bob we can’t lose for these fans, it is not an option' The hairs still stand up on the back of my neck today when I think about it. Bill Shankly was a major influence on my life and I am sure the lives of countless other players and supporters of The Liverpool Football Club. He will never be forgotten, his passion and enthusiasm lit up the game, and the standards he set have inspired me over the last 46 years since I first met him, and I am grateful that I crossed his path. Having left Liverpool in May 1965, here I was forty five years on from the day my Dad and I stood with Bill Shankly in the centre circle at Anfield. The date was the 25th May 2005 and my oldest son and myself, were sat in the grandstand in the Ataturk Stadium in Istanbul exhausted by the events that had unfolded below us. As we soaked up the joy of a fifth Liverpool European Cup triumph, in quiet reflection my thoughts again wondered back to the beginning of the Liverpool success story on that winter day 45 years ago in January 1960 when my father, who sadly passed away in 1991 and I had listened on the Anfield pitch to the great Bill Shankly’s words. 'You are lucky to be here son, because this stadium will be a bastion of invincibility, and this club will be the most famous club in the world.' On that unbelievable evening in Istanbul, 25th May 2005, who would have doubted the accuracy of that prediction? The Club that has won more English and European trophies combined than any other is now owned by two American Multi Millionaires, but the ghosts of the past seem to hang above Anfield as if pleading for the club that they graced with such honour to rise to the pinnacle of English football once again with stylish attacking play that has brought such success over the years. The challenges and opportunities faced today by Rafa Benitez and the American owners are no different to those faced by Bill Shankly, Bob Paisley, Joe Fagan and Kenny Dalglish, but the joy that the winning of the English Premier League by England’s most successful club ever, would bring to those wonderful Liverpool supporters, cannot be underestimated. It has been missing from the Anfield trophy room for far too long.